The oft-maligned Hulk looks and sounds terrific on Blu-ray, as we continue our Avengers movie month. The realm of superhero movies reminds one of a street littered with burned-out cars and potholes. The real trouble has always been finding the right mix of story and action without losing the important pieces of the characters that made them so bankable in the first place. Hollywood’s track record is decidedly mixed: for every Dark Knight and Iron Man, there’s an Electra and Catwoman. And then there’s franchises which didn’t know better and made a second film before closing up shop (see Ghost Rider). Telling the story of a character that’s been around since the 1930’s is not easy, especially for those who consider themselves as experts and know what’s best for that franchise. To the masses, we might be called ‘purists,’ but our high standards have more to do with our OCD and an intense desire to see something done right than being merely picky. I’m sure the purist in all of us wanted to see a Hulk movie do well, but it was interesting that they chose his story to feature first, rather than a more recognized figure like Captain America (wait, they did that ungodly TV movie version in ’95). Thus it came to pass in 2003 that Marvel began its film franchise, with a product that fell completely flat on its face, at least to popular audiences who neither knew nor really cared about the backstory. While I have enjoyed seeing the character brought to the big screen, I know that others were less than willing to embrace the film’s final product, based on the last-minute casting of Eric Bana (Star Trek). I’m aware that Edward Norton was offered Bana’s role first, but declined, which put production off and denied us a more realistic Bruce Banner. Having said that, Hulk does bring the darker elements of the character before us, allowing us to better understand the inner workings of his mind. It’s simply is not as bad as others believe; in fact many of its elements are unique and did the franchise proud. The ‘hand off of animation,’ as stated by one of the film’s producers, is seamless: you honestly cannot tell where the living world and the digital one intersect. Another thing I loved about the film was maddening for others: moviegoers did not like the use of split screens, multi-screens, and transitions. Even us purists admit as to the lack of action, but I appreciated the back story, even if it wasn’t purely canon (remember the television show wasn’t either – ‘David’ Banner?). In every way, Hulk is a superior product to the television show and stands in the middle ground between Thor and Captain America at the top, and Catwoman and Ghost Rider at the bottom. It’s better in many ways than Iron Man 2, but not good enough to overtake its prequel. That’s not to say that Hulk isn’t without its flaws. 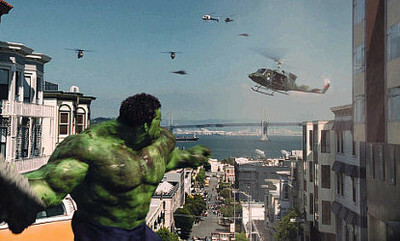 Gale Anne Hurd (Aliens, Terminator 2) said that Hulk brought an Indie sensibility to an epic canvas. The problem is that it develops at such an insanely slow pace that it must have been hard for many people to stick around. While I love the trio of actors Ang Lee assembled, including Jennifer Connelly (The Rocketeer), our characters don't get beyond their dramatic cocoon for the film's first 90 minutes. Nick Nolte (Cape Fear) is over the top as Banner’s estranged father, and his scenes with Bana are uneven. The climax is also a matter of concern, as I felt Lee did not explain Nolte’s demise as well as he should have. 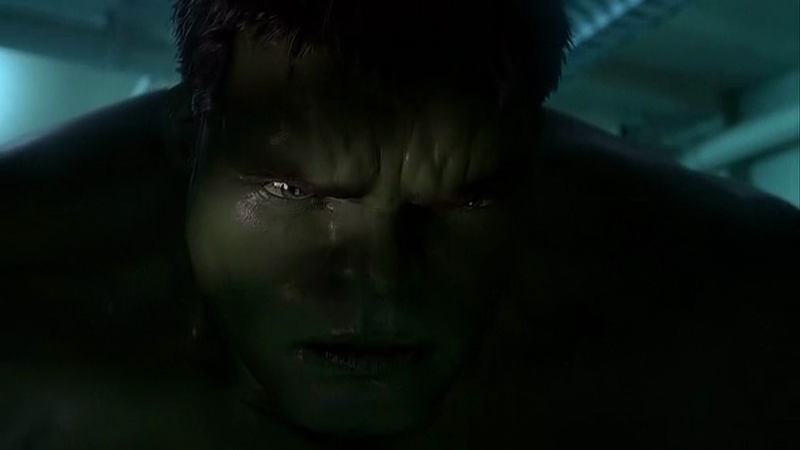 As films go, Hulk isn’t terrible; but it’s also not as enthralling as it could have been. Hulk is presented in 1080p VC-1 1.85:1, giving the audience a near-perfect transfer. Colors are vivid and show no evidence of bleed, haloing, or enhancement. 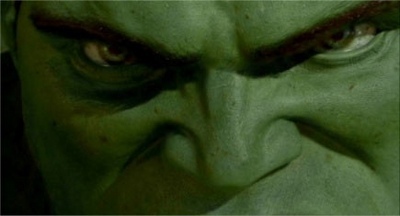 The color of Hulk’s green skin and his muscles are clear and offer surprising depth. Desert scenes and San Francisco’s Lombard Street offer a beautiful visual landscape of color, showing off details not seen in any of my DVD versions (and I have a few). Human features, such as skin wrinkles and Sam Elliot’s (Tombstone) gray mustache and uniform mix well with the sweat and dirt of The Hulk’s features. 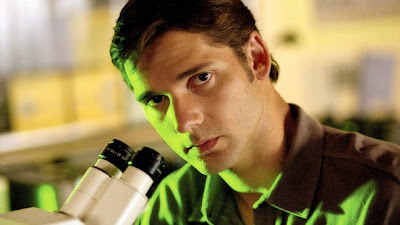 Other elements, such as darker set pieces and lighted lab scenes, are balanced with either side being too bright or dim. Another element that stands out is the comic book-like transitions, which do not stutter or suffer from light variances or stutter as they transition from one frame to another. Given the film’s 2003 origins, the transfer is remarkably clear. Hulk sports an impressive DTS-HD Master Audio 5.1 lossless track that is aggressive, resounding, and flat-out loud. Explosions and gun shots are bone-jarring, helicopters sound like in you’re in the same room with them, but none of these and the multitude of other sound effects ever get in the way of the dialogue, which is crisp and don’t force you to play The Remote Dance. Danny Elfman’s African drumbeats, Middle Eastern chants, and other instrumental stylizing make a forceful impact in both dramatic and action scenes. It’s a neat departure from the heavily-orchestral pieces of the Batman series. The subwoofer delivers The Hulk’s heavy footsteps, heartbeats, and other sounds exceptionally well. I really like the surround track here, which wraps the listener in a collection of forest, city, and lab sound effects. In short, the audio track is exceptional. The Making of 'Hulk' (480p, 23:43) is a four-part feature that discusses various aspects of the film, from actors and crew, to the world of ILM in creating the look of Hulk’s world. Composer Danny Elfman is featured here as well. Evolution of the Hulk (480p, 16:17) looks at the history of this popular character. We are taken through the Hulk’s beginning as a depression-era comic, to the television series and eventual development of the feature film. There’s less of the comic’s impact on the movie here, but a good section on how that pesky Gamma radiation helped to being the Hulk to life. The Incredible Ang Lee (480p, 14:28) is a good presentation of the director and how he tried to bring in several realistic elements into the film, including his own acting of the Hulk, which was used to paint his movements. A very insightful segment. The Unique Style of Editing 'Hulk' (480p, 5:34) takes a closer look at the editing process to make Hulk as cohesive, well-paced, and exciting as possible, while creating for the film a unique look with differing transitions and split screens. So many versions of this film exist that you really can’t go wrong with any of them, even the DVD’s and foreign releases, some which feature very nice Steelbook cases. I reviewed the single-disc version, because it’s the only one in print that hasn’t been bundled with another film. Driven by a good video transfer, an excellent audio track, and nice supplements, Hulk is an overlooked release that’s worth a second look. I know many people look at this first effort by Marvel with a shoulder shrug or even a yawn. Granted, the pacing is slow for an action film, but I like this origin story about Bruce Banner. Whether the storyline matches any of the myriad comic books about The Hulk is debatable to say the least. It might not appeal to the masses, but we purists know better.